Within the last year, our country has undergone some big changes. One of these changes is that two states, Colorado and Washington, have legalized marijuana for recreational use. So what does that mean, and what does that mean for the Conservative? Its law in Colorado, which passed Nov. 6, 2012 under the 64th Amendment, states that an adult over the age of 21 may possess up to one ounce of marijuana. Adults may also grow up to six plants for private use. Washington’s I-502, an initiative on marijuana reform passed by the Washington State Legislature, allows an individual over the age of 21 to possess up to an ounce of marijuana. Many Conservatives may believe that this could hurt our country, that marijuana users will start smoking wherever they feel led. In both states, smoking marijuana in public is illegal, and driving while under the influence of marijuana comes with the same penalties as driving drunk. Should we be concerned with the legalization of marijuana? As a Conservative, I see no reason to be concerned. In fact, positive results could come from the legalization of marijuana. According to the BBC, illegal drug use is on the rise worldwide, and expanded efforts at controlling the global illegal drug market are failing. “We should look to implement policies that place community health and safety at the forefront of our efforts and consider drug use a public health issue rather than a criminal justice issue,” Dr. Evan Wood, chairman at The International Centre for Science in Drug Policy in Vancouver, Canada, said. By allowing the legalization of marijuana, the funds used to fight marijuana can be used to focus on health care and substance abuse counseling for harder drug users. That means that officials who fight harder drugs — such as heroine, cocaine and, worst of all, meth — would be given more funding to get these drugs off the street and to get users help. Practically speaking, these funds could be put into rehabilitation centers. The second positive outcome is the taxation of marijuana producers and marijuana users. In Colorado and Washington, manufacturers and distributors have to be licensed by the state. Licensing would help the states’ economies through collected fees. “Marijuana licensing fees are higher than any other industry in Colorado, up to $18,000 per marijuana store, more than enough to fund regulation,” Robert J. Corry, Jr. of The Denver Post said. Also, for every purchase of marijuana, a sales tax is charged. According to The Denver Post, a 15 percent excise tax is charged on every marijuana sale, along with a 10 percent sales tax. That equals 25 percent tax in total for the sale of marijuana, and for the state of Colorado, that will bring in a lot of revenue that the state can use. The legalization of marijuana could help this country get rid of some of the debt we have accumulated. The third and final reason why marijuana legalization is a good idea is because, whether or not marijuana is legal, people are going to smoke it. With marijuana being illegal, users have to pour money into drug dealers. These drug dealers are importing their marijuana or growing it secretly. No one can know what is in the marijuana they buy, and according to the Center for Substance Abuse Research, there have been cases where users have bought marijuana that were laced with chemicals. If marijuana is legalized, the marijuana producers will be under the eye of the law, and what they grow will be solely marijuana plants. Users buying marijuana from a legal producer will not fear it being laced with any such chemicals. Thus, it will be much safer if marijuana is legalized. Keeping marijuana illegal is redundant and reminds me of the prohibition of alcohol. People still drank, but instead of the revenue being taxed and going into the government, it went into the hands of people like Al Capone. As other states debate whether the legalization of marijuana is worth it, remember that legalization could be some states’ ticket out of debt, will take money out of the hands of criminals and will be much safer. At the time of New World exploration, Spanish and English colonists brought over and grew cannabis as a source of dietary fiber. Fast-forward five centuries, and America’s use of it is quite tainted. Before the discovery of potential health benefits, many users said they smoked it as an escape to get away from life stresses and issues. The theory of “smoking your stress away” is a failure because the issue still remains when drug supplies run dry. Cannabis, or in other words marijuana, has been a controversial drug and is now being approved by state constitutions. Colorado and Washington allow the use of marijuana for more than just medical reasons. 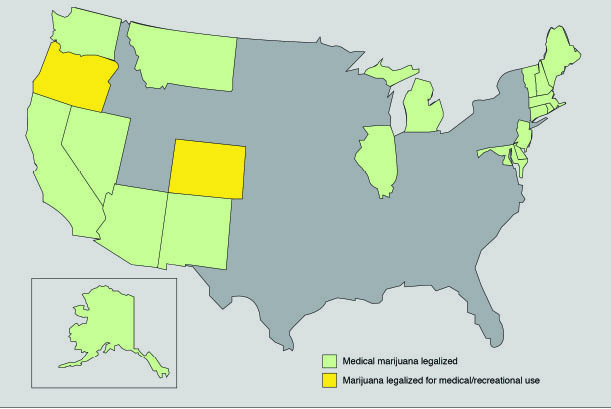 According to medicalmarijuana.org, 20 states have allowed the use of medical marijuana. Colorado and Washington have also placed restrictions on the drug, prohibiting public use by only allowing citizens to carry one ounce of the substance and, most importantly, placing an age limit of 21 or older to buy and use the drug. While it may be debated, marijuana can be used as a stepping stone drug to harder and stronger drugs such as cocaine, heroin, meth and phencyclidine (PCP). Also, while doctors and physicians may say that marijuana can be helpful in treating diseases such as cancer and HIV, it is not fully proven. According to the Food and Drug Administration (FDA), there has not been enough test trials with marijuana to prove its health benefits outweigh its defects. A marijuana plant may contain more than 400 chemical compounds differing from each plant. Still, while the debate of whether marijuana should be legalized is up in the air, I believe that it should not. The health benefits from the drug are temporary, and the downsides, such as addiction from its use, could eventually harm an individual. Rather than from a health point of view, Colorado and Washington have found a “positive” way for the use of the product. Melissa Cammack of Global Communications News Network wrote in an article that Washington and Colorado consider that legal marijuana will help the local economies fund the states due to the high tax placed on the product. Although this may seem glamorous, Americans must realize there are other ways to strengthen our economy, such as resetting mortgage rates, according to barrons.com. Marijuana is a tough drug to let go of, and in some cases, it can be as addictive as alcohol and cigarettes. We can see the long-term effects those do to the body when abused. According to addictionandrecovery.org, marijuana users are four times more likely to develop signs of depression and triple the chances of forming psychotic symptoms. Moreover, the drug is about as strong as a 60-120 mg of codeine when treating pain for a cancer patient. Instead of trying to force Americans to inhale the “benefits” marijuana may produce for the U.S. market, state governments and Congress need to rethink a more profitable, non-destructive perk for the economy. Yes, it’s an .edu site. Yes…its ok. I appreciate this legalization if works as the excellent way described above. But it can increase the number of bad outcomes like social crime. At the end of the day, ultimately it can reflect bad effects to our young generations. The number of people seek treatment for cannabis withdrawal are increasing dramatically in last decade, said by WHO. So we need more consciousness and more studies about weed before its legalization. Hopefully government will take this issue seriously. What social crime do you think MJ causes, other than laziness? This entire article is founded on false assumptions. I encourage anyone who believes these lies sit down with someone who uses the medicine as an actual medicine, seeking genuine understanding. I truly believe your ideas will be challenged deeply. Jess asked you a question. I did not see your answer and would be interested to know what social crimes are involved in smoking marijuana. With cigarettes, the system constantly commits a social crime by allowing society to buy legal poison, a poison that will specifically be used to allow and encourage someone to contribute to a possible early death from cancer or cardiopulmonary problems. These increase overall health care costs. In the overwhelming majority of automobile accident deaths, alcohol has been the factor. Marijuana was made illegal for reasons having NOTHING to do with the weed itself and its effects once consumed. It was made a Schedule I by Richard Nixon for pure political reasons, in order to destroy the youth of America, whom he viewed as his enemy. Finally, the U.S. is coming to their senses. First: if we justify behavior previously veiwed as criminal should we not also legalize prostitution? The medical side effects can be controlled much more easily than those of smoking a toxic chemical such as THC. Second: so raising money is the end all be all of what is right and wrong? It something is profitable its good? Well your “profits” will be eaten up in higher medical costs (specifically psychological/psychiatric). And how will you keep your cops from smoking it? With drug tests? More money. How will you keep your day care center workers off it? More drug tests? More money. Third: comparing the 18% of the US population who have smoke MJ regularly to the 60% who drink alcohol is a very foolish apples/oranges comparison. We know practically everything there is to know about ETOH. We know next to nothing about the 400 cannabinoids and other chemicals in smoked MJ. Fourth: there is NO benefit medically from smoked marijuana. Even glaucoma sufferers would have to smoke it ever few hours to have see medical benefit and the SIDE EFFECTS would vastly outweigh any “good” done. Finally, THC’s value as a “pain killer” is practically zero. There are far better, more efficient drugs WITH LESS SIDE EFFECTS for treating pain. A stoned society is a stupid society. And that is what governments want…stoned, stupid and dependent people. First of all, the “toxic” chemical is no where near toxic, THC is a brain enhancing stimulant, and is not at all harmful to you. Second: your argument about money, and profiteering is no where near accurate, if Cannabis was legalized it generate far more revenue than could compare to expenses. do you even know how much a drug test costs?? im not trying to target you, or even belittle you at all, i’m just trying to explain, and counter your arguments with logical facts. A drug test is next to nothing compared to the price that could be charged for medical marijuana. Third, there is way more than 18% of people who would openly admit to smoking marijuana, but the reason that the number is significantly lower than that of admitted alcohol drinkers is because it is illegal, whilst alcohol is not. I came here because I’m writing a paper on the pros and cons of marijuana legalization. I have to say that your image is misleading. It shows Oregon as having legalized for both medical and recreational, when it should be Washington. Your article has the correct info. I will be citing the article, but I do hope you correct the image for others in the future. Stepping stone? That argument is as old as dirt and stinks of dead fish! Alcohol is the stepping stone for most people. Anne, so TRUE! The legality of cigarettes and alcohol pretty much prove it. Thanks for sharing such a worthy article. The medical marijuana is a very beneficial herb. Modern researches suggest that cannabis is a helpful aid in the treatment of a wide range of health issues. These include pain relief — particularly neuropathic pain — nausea, spasticity, glaucoma, and movement disorders. We appreciate this……………Hopefully it will create a good sense. Thanks for marvelous & informative article. Yes, Marijuana is the most illicit drug used all over the world. It is proved that marijuana causes brain damage, learning disabilities and reduce ones cognitive functions. Its legalization may produce many bad effects on student society and as well as others. We need more consciousness about it. Legalization may kick student lives of that state. So we needs to prevent it and establish proper treatment for addicted one. To treat the addicted one, At first we need to detect them and take him away from marijuana. One of the biggest hurdle to quit smoking weed is withdrawal symptoms like insomnia, anxiety and panic attack, vivid dreams and so many on. To get rid from it about 80-90% of people start again taking weed. You obviously have never had chronic pain, or any other debilitating illness, if you did you would know how very helpful this medicine, (which is a natural substance) helps, not only with the mental anguish but for the physical help as well. There are lots of folks out there that wish to take their minds off their problems who many use alcohol, drugs and marijuana. Those people want to change their reality for other reasons, people who are sick feel differently and are chastized for it. It does help! Tremendously. I go to a pain mgmt Dr. all he wants to do is give me drugs that have nothing but side effects, I can’t use marijuana or else he will make me go to an addiction assessment Dr. what does he think he’s doing to me? Is a narcotic something that causes addiction? Physical? Absolutely but not mentally, the only reason I take them is so I can walk without assistance. Marijuana does not cause addiction, you can stop and not have the shakes or vomit or have chills for two or three weeks. It’s just plain stupid and you obviously haven’t educated yourself before making a comment. Amen. This RN backs you up on this. Thanks for sharing! I’ve been suffering also from gouty arthritis for 6 years now. Cannabis reduced my pain to a more tolerable level. In reading this article, I notice that no one is listed as the author of it. I also notice that the article is in conflict from one part to the other. There also are other points of conflict. You can’t be for both. Which one do you believe is right and clearly state so? Marijuana should be legalized throughout the country as it would assist our state governments with tax funding. Just take a look at Colorado, California, Washington, and others. It’s really sad that a site like Clean420.com should even have to exist writing reviews on detox products. There should not be a threat of being condemned for the use of marijuana. This comes from an individual who has not used marijuana in over eight years. I’m not pro legalization so I can smoke it. I personally do not enjoy it any longer. My mother is a veteran called to ready reserve status Army Nurse Corps during the Iraq War. She developed a disorder known as occipital neuralgia caused by a nerve entanglement in the surrounding musculature of her head. Occipital neuralgia is also known in circles as “the suicide disease” because so many sufferers turn to suicide to end their suffering. Mom had a nerve ablation in which the surgeon was able to visualize the abnormality but was only able to ablate part of the nerves causing her pain. She was also trialed on an implantable neurostimulator. That surgery was tough on her and was not successful in alleviating her pain. She was on high doses of narcotic pain medications pretty much around the clock for a number of years which made her pain bearable but certainly did not alleviate it. She struggled to do her normal gardening, cooking, and laundry. She also nearly died from an accidental overdose on hydrocodone. The family talked to her for a number of years about trialing CBD. She finally did after her near miss on the hydrocodone. Where the narcotics (highly addictive and potentially lethal) failed in alleviating her pain, she now has periods pain free on CBD/THC blend sublingual tinctures. She has moved to Colorado and hikes regularly. It has been life changing. I wish I could say that this story had an entirely happy ending. Unfortunately, due to her medication being illegal in Iowa, my mother is unable to watch my first daughter growing up. Lucy is 18 months old now and I wish they could spend more time together. Prohibition of a non lethal substance with medicinal properties leaves the suffering to suffer, it criminalizes the medication of (and the life of) an Army veteran, homemaker, grandmother, and a nurse of over 3 decades of healing others in her field. And it separates the family. I’m split on cannabis. I can see the pros and cons of both sides. I don’t think anything is going to stop it being eventually legal in all states. Marijuana has been used for medicinal purposes for over 4,000 years. From the first sight , a lot of people believe that its a debatable topic, I think that the disadvantages that marijuana can give are serious enough to consider it an harmful thing. In the past few decades, the supporters of legalizing marijuana have made a case for it citing the medicinal use of the drug, and they have had a lot of success. . Most states have decriminalized the drug for medicinal purposes and have replaced incarceration and criminal charges in favor of civil fines and drug education programs. Undeniably , marijuana is playing a huge role on one’s health. Its a fact that marijuana can cause an increase in anger, anxiety, irritability, violent outbursts, etc. It can also increase the risk of developing cervical cancer, prostate cancer, and adult-onset glioma. As compared to harder drugs like cocaine, heroin, or crystal meth, marijuana is considered to be a soft drug which is less addictive and less harmful. But in several cases, there is a possibility that use of this drug can act as a stepping stone to trying out harder drugs. Keeping marijuana illegal makes it that much more difficult for someone to get addicted to it and be tempted to try out other, stronger drugs. Moreover, marijuana can harm the young people who are the hope and future of human kind. Marijuana may affect the development of the brain if smoked at a young age. This is not only harming the future of young people, but also the future of our country and the world. If marijuana was legalized, then it would become more easily accessed by younger generations, with fewer stigma attached to its consumption. Obviously , the legalization of marijuana is absolutely wrong and needs to be changed. I really don’t know what the fuss is all about! Marijuana is a relaxing aid more than anything. Is such a nice high and helps me with pain. Yes, there are down effects but not as bad as alcohol in which if any kid wanted to. Can easily get their hands on it. It has always been the Hard drugs that are the problem, The ones that people get hooked on almost straight away. These cause the crime etc. There would be so many benefits in legalizing the weed, People are going to smoke it anyway so why not. You can debate it all you want back and forth but the reality is whether you like it or not it will become legal in Canada for medical and recreational use in 2018 in the states are moving rapidly to approve it for medical use so right now my stock portfolio is growing nicely. How do I cite this page in APA format? Absolutely but not mentally, the only reason I take them is so I can walk without assistance. Marijuana does not cause addiction, you can stop and not have the shakes or vomit or have chills for two or three weeks. It’s just plain stupid and you obviously haven’t educated yourself before making a comment. You medicinal condition have to be one of the conditions classified within the marijuana law of the state. valid in a medical cannabis dispensary of a specific state. arrested if found using or within the influence of medicinal marijuana within their workplaces. marijuana dispensary of the specific state. of city council, gone to live in introduce a bill that could enact Initiative 59, and had 9 of 13 council members supporting it. Believe it or not, the cannabis industry is a multi-billion business, and if all governments will consider and regulate it, they can also benefit a lot. Don’t say no to cannabis, regulate cannabis! It is a promising herb indeed! Thanks for the insightful article. be in full achievement with local while stating authority regulations. has the proof of a doctor’s approval for their marijuana treatment. In my personal opinion, cannabis is an amazing herb. It cured my arthritis. I say it because my pain literally melts away with marijuana. Thank you for sharing! Are you going to update this list? I think there are a few more states that have legalized it for recreational and medical use! The movement is real. While cannabis is a tough drug, it has a lot of medical benefits. Let’s legalize medical cannabis! Great information! I totally agree that Marijuana is a tough drug to let go of, and in some cases, it can be as addictive as alcohol and cigarettes. Nice post! Very informative post and I really found some amazing facts on the comment section. I agree with the legalization of medical marijuana though the law should be properly taken care of. I found it interesting how you mentioned how the legalization of recreational marijuana has boosted the economy of the United States. My wife and I are always looking to make the world a better place for our grandkids to grow up in and I feel like a boosted economy can do just that for them. I will keep this in mind as we search for a recreational marijuana dispensary near us to invest in!